The Hatton windowbox is perfect for any window ledge, wall or fence. The clean lines of the Hatton will accentuate the beauty of your plants and flowers whilst looking good in its own right. 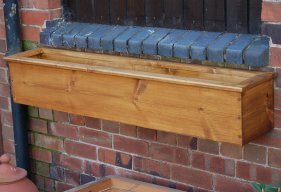 Hatton windowboxes are made from Scandinavian red pine and have an easy to use, concealed hanger (supplied with all fixings), plus holes in the base for good drainage. If you would prefer a plain back to stand on the windowledge rather than hang on the wall or fence make a note in the 'special instructions' box on the way to the checkout. The windowboxes can be finished in clear, golden brown or wild sage preservative. We also offer a selection of Farrow & Ball paint finishes. 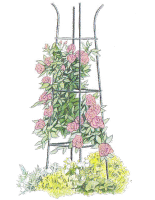 Surprisingly few pests affect window box plants - far fewer than in the open garden. You may notice occasional unsightly bites out of a leaf or petal, but these isolated incidents seldom merit the wholesale use of chemical controls. Only one or two stubborn pests need chemicals to effectively get rid of them. As a rule, the fewer chemicals you splash around, the more beneficial insects - particularly lacewings and ladybirds, but even wasps and hoverflies - will move in and do the job for you. These mini-predators have voracious appetites for aphids and other insect pests, and with care it is possible to establish a balance between friend and foe. You can even buy beneficial insect larvae to introduce into the garden, but if you do this, you will need to avoid chemical controls completely. Also, unless you retain a few insect pests as a food source, your population of 'goodies' will eventually die out. elsewhere. The pansy aphid, for example, colonises the stems just above soil level. Damage caused by aphids tends to be more unsightly than fatal. However, in the case of pansy, lettuce and carrot-willow aphids (which can devastate parsley and other herbs of the same family), you may become aware of the problem only when the plants start to lose condition, by which time it is often too late to do anything about it.Aphids can spread virus diseases among plants and can also, indirectly, cause the fungal disease sooty mould. The fungus lives on the sticky honeydew the aphids secrete and, if left unattended, clogs up plant pores. The easiest way to deal with this is to wash the affected plant with warm water to which a small amount of washing-up liquid has been added. Many insecticides control aphids, but one, pirimicarb, is specific to this pest and will therefore not harm natural predators. A solution of soft soap, available in a ready-to-use trigger spray, is a good organic alternative.